I’ve always said you can tell a lot about a restaurant by the bread and butter they bring you when you sit down. August’s is always warm and feels like it was baked just for you. The butter, definitely local, gives a “just-churned” vibe. The server who brought out the amuse bouche spoke too softly for me to catch what it was, even when repeated, but I did make out one word: Muscadine. Whatever it was, it was good. I ate it. My first course was a salad of chanterelles and blue crab meat in a light ravigote. Also in it were peaches, lardons of Benton’s bacon, baby mustard greens, and vinaigrette that I think was also made from peaches. I literally love every ingredient in this dish and the fact that all the components were local, seasonal, and probably organic too. August sources pretty much all of its ingredients this way, and the quality of the end result is obvious. Most salads kind of bore me, but this was a stellar blend of flavors. My dinner date’s first course was gnocchi and blue crab meat with generous shavings of black truffle and pecorino. Ignoring again that I love all four of those things, this was also sublime. Just imagine together the expertly made gnocchi (not at all heavy or chewy like inferior versions), the mild sweetness of the crab, the aroma of the truffle, and the creamy saltiness of the pecorino. 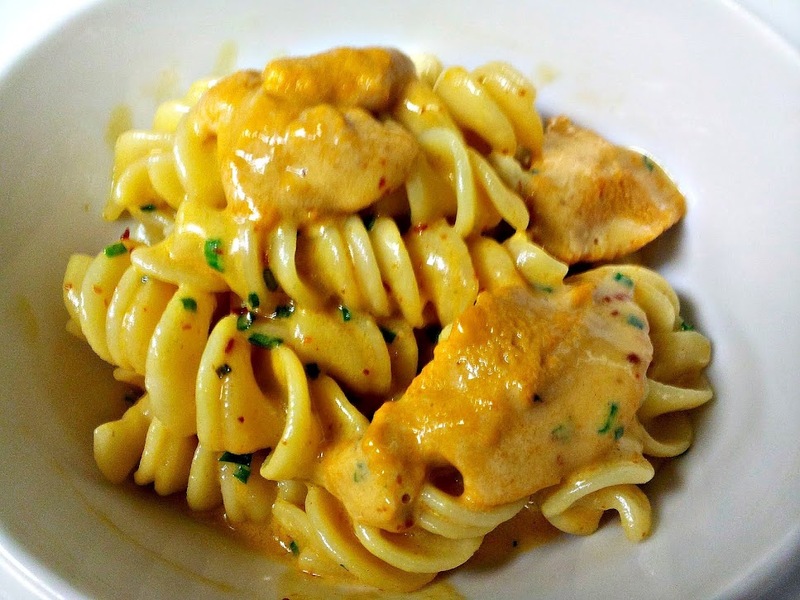 My next course was also pasta and another exercise in things I love: Fusilli, uni, Florida bottarga and Aleppo pepper. When I was younger, I wasn’t a fan of sea urchin or dried mullet roe (in this case, grey mullet), but now I can’t get enough of either. Aleppo is a wonderful pepper that, although hot, has hints of sweetness and cumin. Anyone who enjoys seafood would like this dish. Having lived in Italy for a while, I can be a tough audience when it comes to pasta, but both pasta dishes were excellent in completely different ways. Did I mention that both the gnocchi and the fusilli were made in-house at the restaurant? My main course was medium-rare slices of Mississippi Blackbelly Lamb saddle. Baby peppers and olives from Liguria(!) surrounded the meat and balanced the taste of it quite nicely. The meat itself, wrapped in a sort of roulade way around braised lamb shoulder, was on top of a polenta flavored with more of those chanterelles. (They’re at the peak of their season, I’m not complaining.) Again, a great and a refreshing way to serve a protein that’s usually confined to chops and kebabs. The sommelier also paired it for me with a delicious Shiraz that I didn’t catch any of the details about, other than that it was round and lush and went beautifully with the lamb, his favorite dish on the menu. She got the other entrée I would’ve ordered, a flank steak crusted with bone marrow (like my lamb, also locally sourced from Two Run Farm and served medium-rare). These came with gremolata and potatoes whipped with burrata. A safe yet exquisite bet for any meat lover. Also I’ve never seen Kate eat beef before, but she couldn’t resist this. That’s saying something. Of course we saved room for dessert. 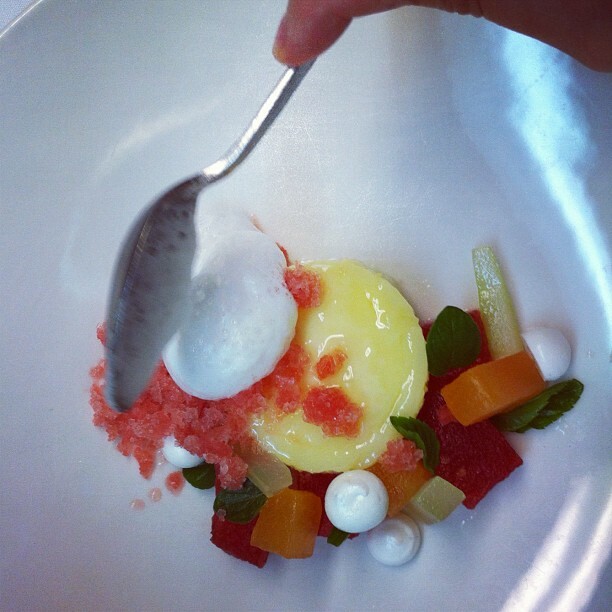 Chef Kelly is super-playful with textures, and I love that all her desserts call to mind childhood sweets, albeit more complex, elegant versions that have a careful restraint when it comes to using too much sugar. 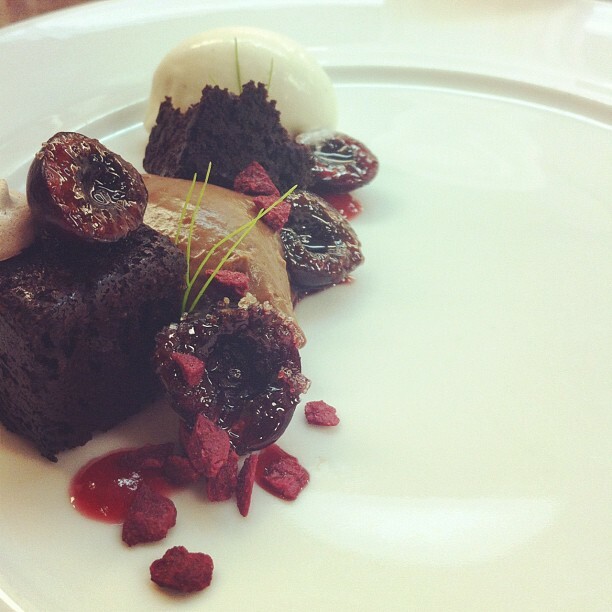 I immediately ordered the devil’s food cake with cherries and caramelized coconut milk. I think there was a touch of buttermilk in there too. There was no lack of dark chocolate and it was mercifully less heavy than every devil’s food cake I’ve had before. An attractive sin indeed, worth repeating. Kate leapt for the banana pudding with its bruleed bananas, peanut butter powder, housemade marshmallows meringue, and “nilla wafer” ice cream. “It’s deconstructed,” she said. And I’m pretty sure those were the only words she said to me until the dessert was gone. If you’ve never had marshmallows made from scratch that weren’t out of a bag, you need to try them. 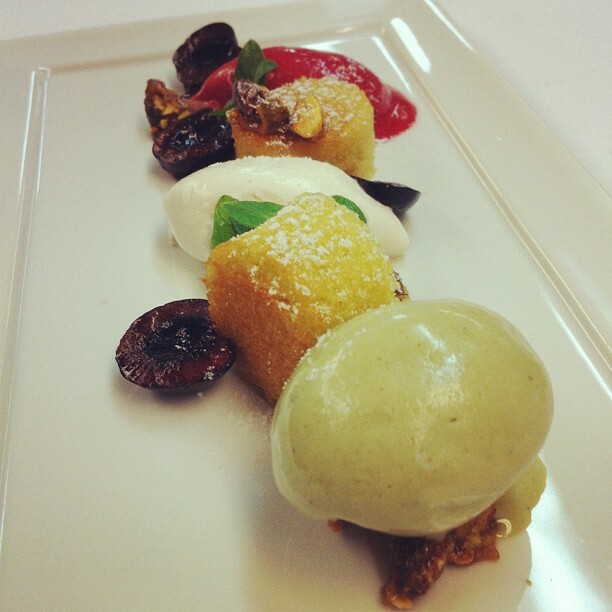 She said that the stains after she finished one of her earlier plates could be modern art, and I counter with this dessert: Pistachio Pound Cake with tart cherries, pistachio ice cream, and cherry sorbet. I don’t know why almonds, peanuts, and hazelnuts get all the pastry love. This was awesome. I honestly wanted to frame the plate with the smears of dark chocolate, the bright green from the ice cream, and the deep, cherry red. Okay, so this last one isn’t so much a childhood treat as a gimlet, but it was still refreshing and delicious: Lime-buttermilk pudding cake with compressed local melons, cucumber(?) and gin foam. Also great when you’re quite full because the soft textures of this dish make it pleasurable and easy to eat. I love gimlets. Do the math. Finally some mignardise came with the check: Pralines, profiteroles, peach gelee, chocolate ganache truffle. Ate them all. Needless to say, I loved this meal, and it’s probably going to be the ones I talk about forever. Thanks for reading through if you made it this far. Thank you again Chefs Besh, Gulotta, and Fields.